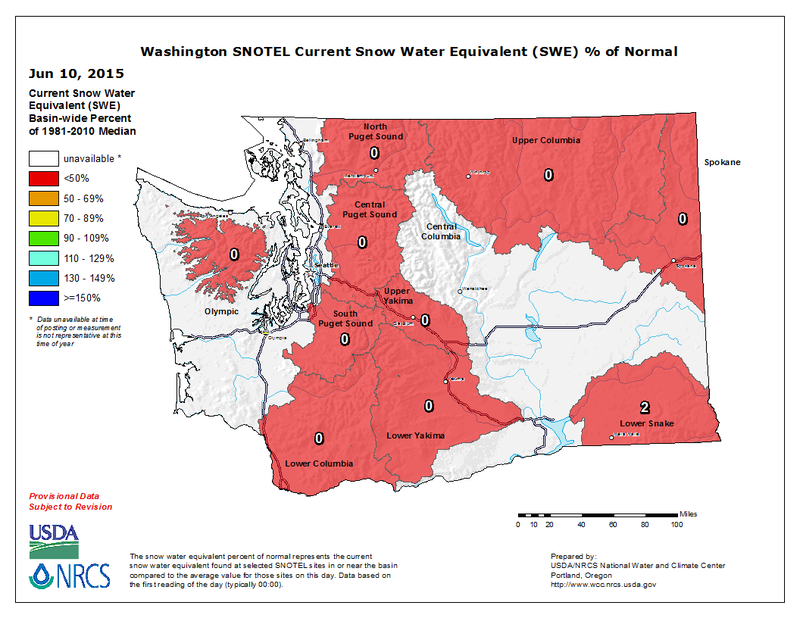 Although Washington may not be officially experiencing a meteorological (precipitation) drought, we are certainly suffering from a snowpack drought which is likely to have many varied consequences for Washington growers and residents. Agricultural and hydrological drought conditions are either happening now or are expected to develop/continue in the coming months as a result of low water supplies / stream flows and the associated agricultural impacts. Socioeconomic drought caused by potential agricultural losses is also a distinct possibility for later in 2015. Unfortunately, the overall drought situation has worsened slightly since the previous drought report, especially from an outlook perspective. 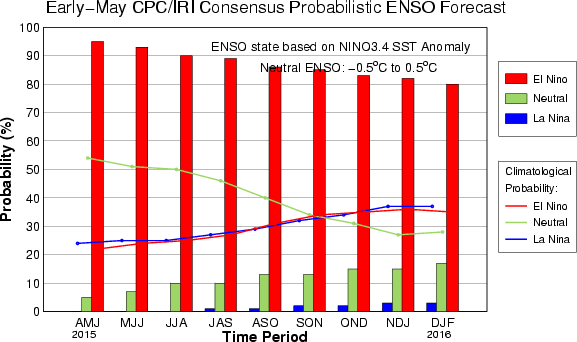 While many climate indicators, including various dynamical and statistical models, continue to suggest enhance odds of warmer than normal conditions through early 2016, the most notable development has been the change in the status of ENSO (El Niño Southern Oscillation). 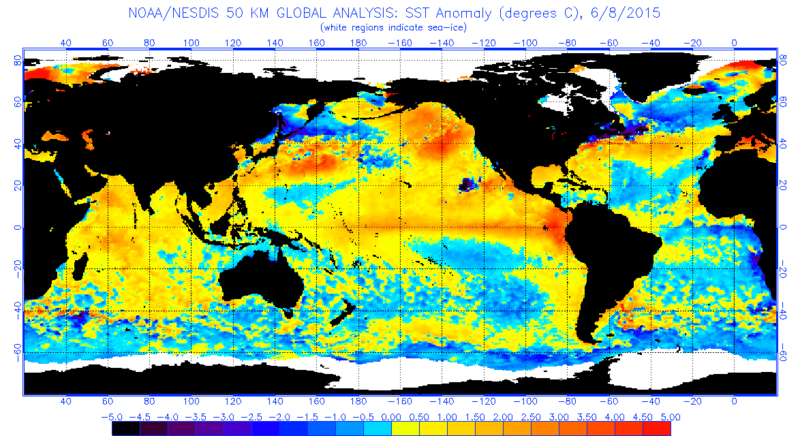 Recent observations indicate a strengthening El Niño (Figure 1), while forecasts suggest a strong likelihood (80%) of El Niño persisting through next winter (Figure 2), with a better chance of a stronger event relative to the previous writing. If there is a silver lining to be found, it is that the Pacific Decadal Oscillation (PDO) has weakened slightly (while remaining positive). 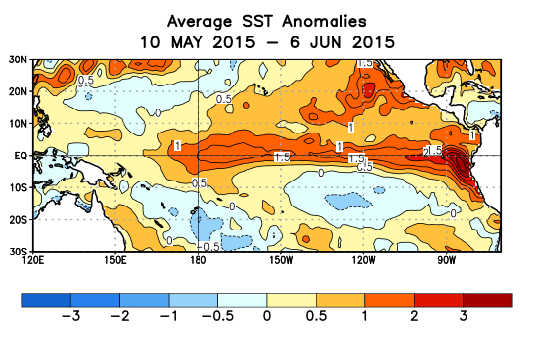 Still, a large mass of anomalously warm water persists off the west coast at the present time (Figure 3). The mountain snow-pack is essentially zero as of early June, which threatens water supplies later in the summer. Warmer than normal temperatures are likely for the growing season, which increases the odds of abnormally high evapotranspiration (ET) values, and thus elevated demand for irrigation and other water resources. Warmer (and perhaps drier) than normal conditions are anticipated during the upcoming cold season, which favors another low snowfall/snowpack year for next winter/spring, which in turn increases the odds of another snow/water supply drought year in 2016. The heavy rainfall on May 13th in south central Washington was a welcome event from a watering needs perspective, although it did not appreciably change the overall trajectory of the drought situation. Unfortunately, water was shut off in the Roza Irrigation District for much of May due to low water supplies. Despite the immediate hardship, this was a positive, proactive step that was intended to save water for later in the summer. In general, May was another warm month which essentially eliminated any remaining mountain snowpack (Figure 4). Prosser's spring season (March to May) was second only to 1992 for the warmest on record (since 1990). More recently, the present early June heat wave sent temperatures soaring as high as 106 degrees (Benton City, June 8th), while lows were as warm as 79 degrees (Wahluke Slope, June 8th). As we look into the near future, we expect some minimal heat relief for the middle of June. However, mainly dry weather should continue, and temperatures will remain above normal. It speaks to our recent climate history and to our present mindset that the upcoming "cool down" to merely moderately above normal temperatures is seen as a welcome improvement.